‘Although this topographical plan was made by the military to record the overall defensive situation at York, it gives us an excellent picture of the amount of land that had been cleared and built-up by 1818. The Old Town was fairly densely settled, although the grounds around most houses were large enough to accommodate vegetable gardens, poultry, and livestock. Settlement in the New Town was still very sparse. 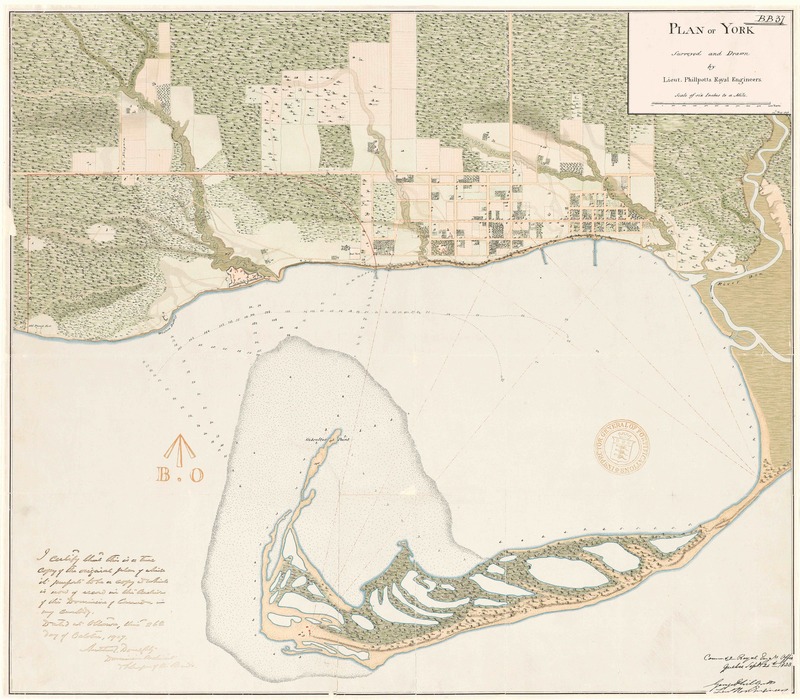 York was still essentially a village and had grown little since 1813, an indication that the area set aside for the town was for many years too big for the population. Click the image to view a full-size version (PDF). Plan of York Surveyed and Drawn by Lieut. Phillpotts, Royal Engineers. Although Phillpotts performed the survey in 1818, he did not draw the map until 1823. 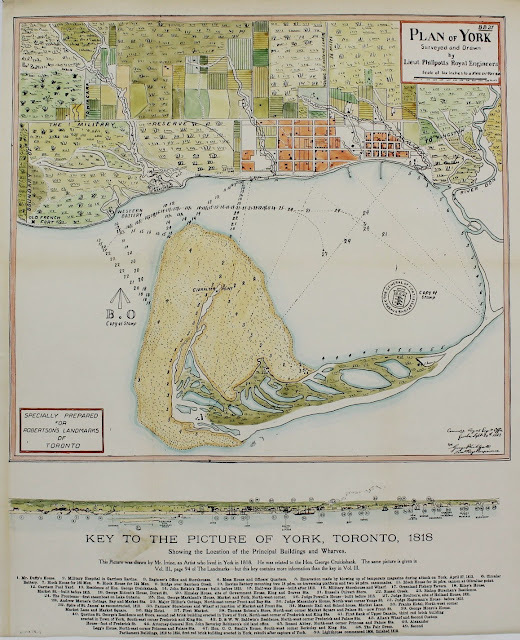 ‘George Phillpotts was a lieutenant in the Royal Engineers, when he made the fine 1818 map of Toronto. He was appointed aide-de-camp to Sir John Colborne in 1833 and was assistant Quartermaster General during the 1837 Rebellion. 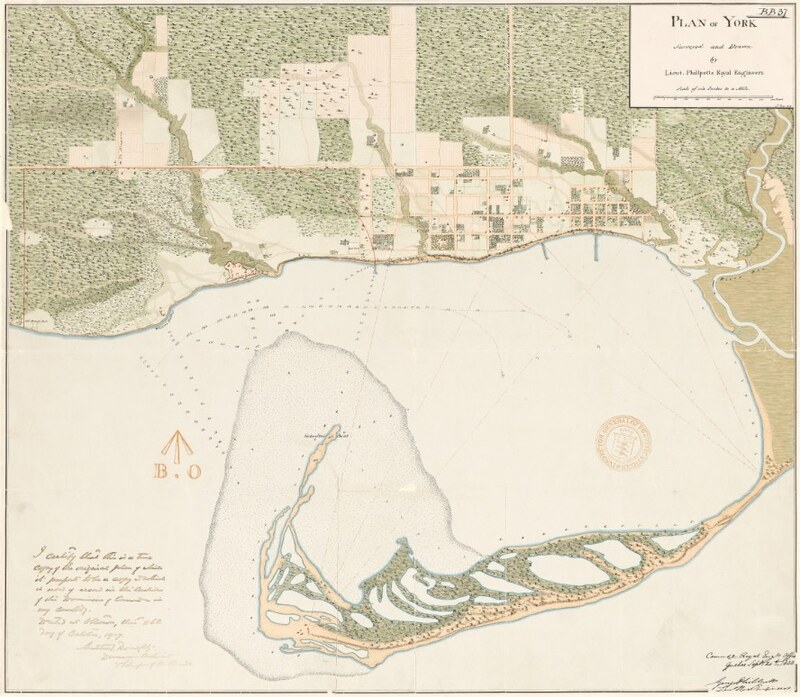 The Royal Engineers were stationed in Toronto from the earliest period of British settlement and made reconnaissance sketches and topographical maps for the defense of Toronto as well as plans of the fort and military property. 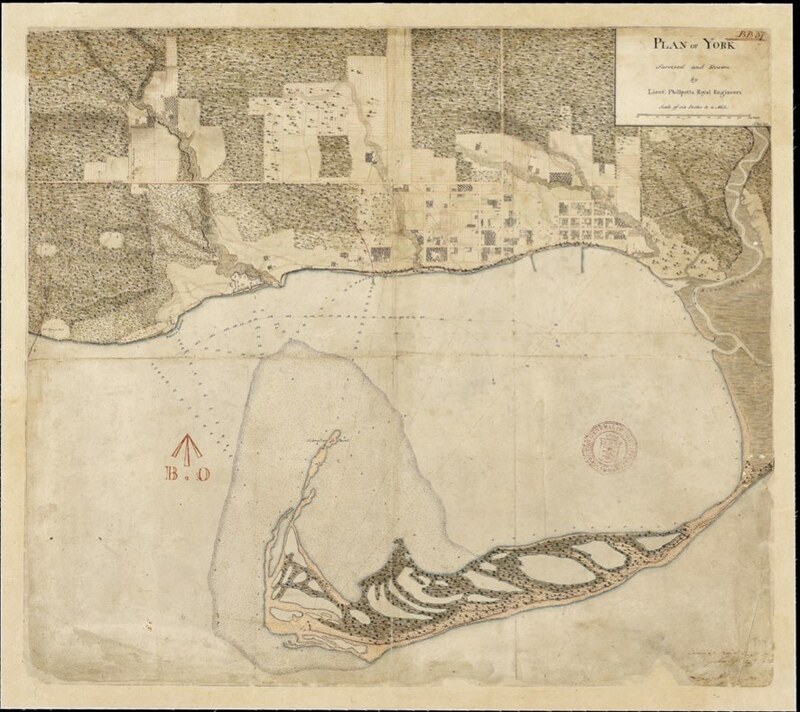 Unlike the civilian surveyors who were primarily concerned with property lines and boundaries, the military were more interested in the shape of the land and location of forested or cleared lands, passable roads, buildings, and other landmarks. 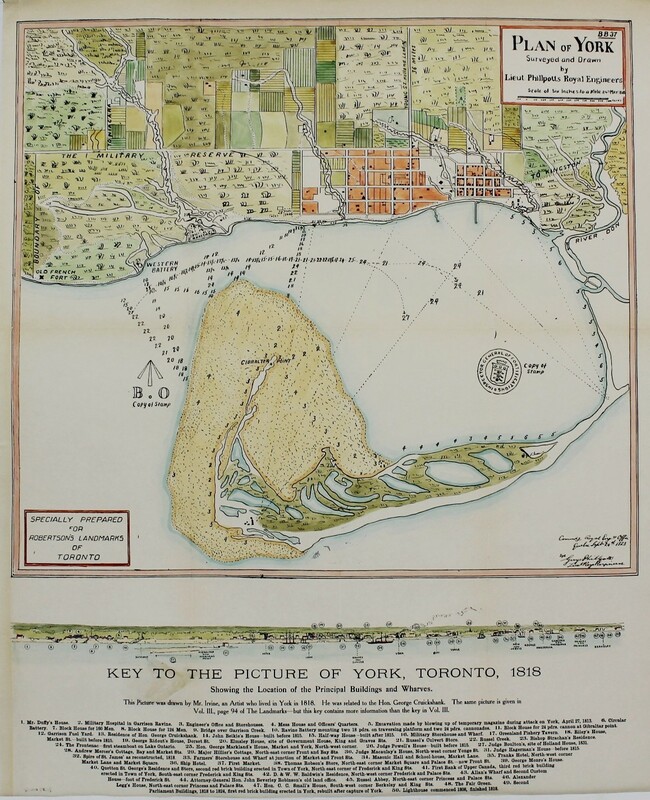 Some of their maps of Toronto were the most detailed produced at the time.’ - Ganton/Winearls, ibid. The following copy of the map was possibly done in 1907 (see archivist’s note, bottom left). Click the image to view a full-size version (5 MB). Original image scan courtesy City of Toronto Archives: MT 109. Large version liberated by W. Xavier Snelgrove. 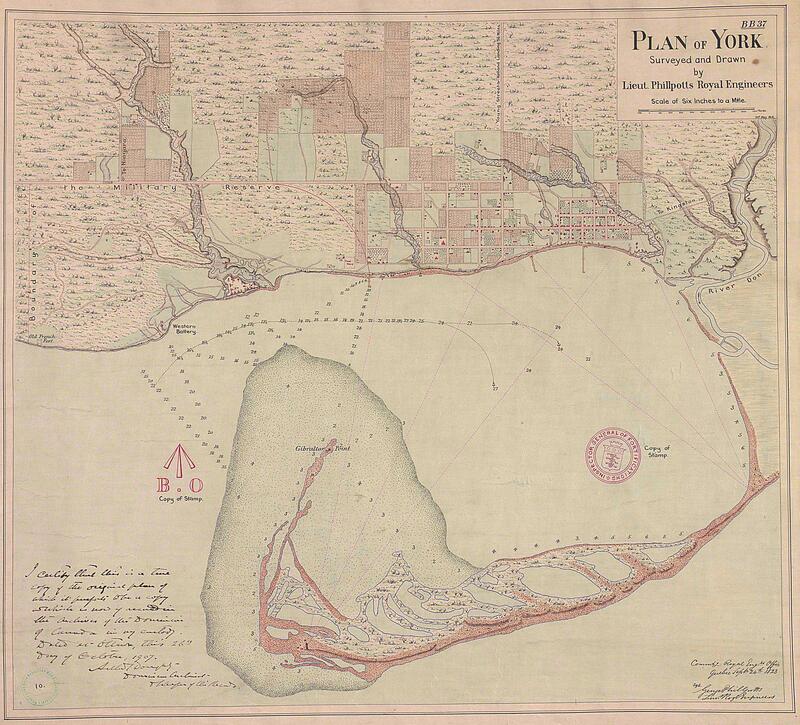 See also the version posted by U of T.
Plan of York U.C. 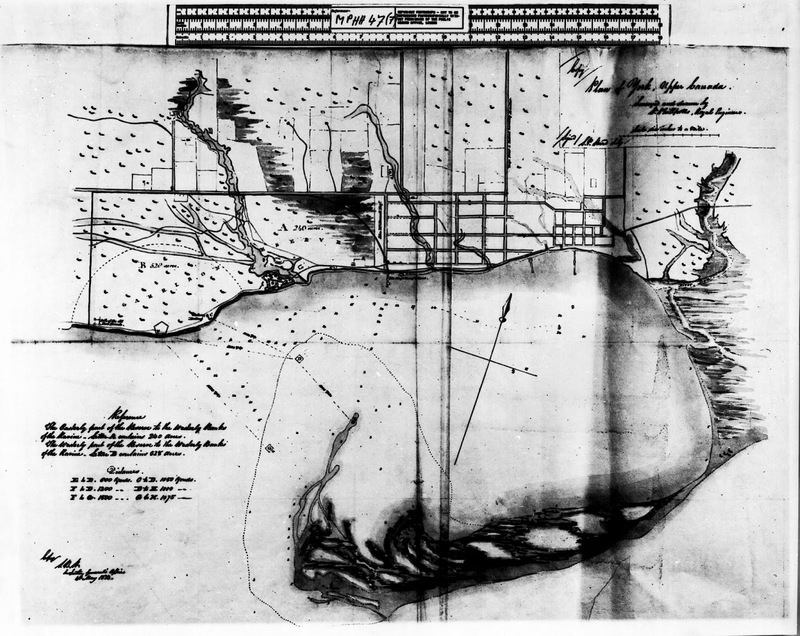 Surveyed and Drawn by Lieut Phillpotts Royl Engineers. Copy by J.G. Chewett [Sgd] S.P. Hurd S.G.